Display your support for breast cancer using this Personalized Hope and Love Canvas Tote Bag. It is the perfect way to keep your belongings close without having to carry a purse and provides a great way to spread awareness. Take your Personalized Breast Cancer Ribbon Tote with you to the gym, library, work, grocery store and to breast cancer walk events. 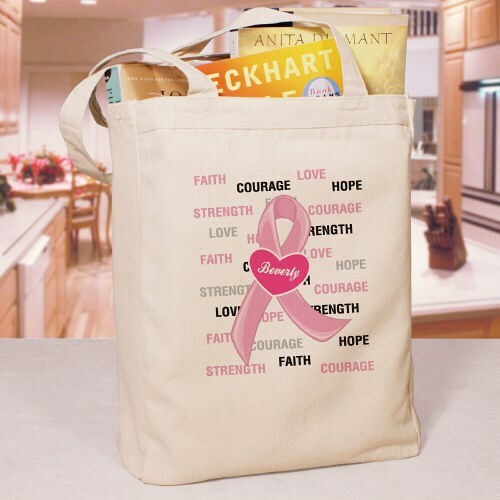 Our Personalized Hope and Love Breast Cancer Awareness Canvas Tote Bag is a 100% cotton Canvas Tote Bag measuring 16"h x 14"w. This tote bag is made especially strong to hold all your take along items. Includes FREE Personalization! Our personalized totes also make for beautiful breast cancer awareness gifts. Show your support and increase awareness with Personalized Breast Cancer Apparel and Walk Gear from MyWalkGear.com. Choose from our wide selection Custom Printed Breast Cancer Apparel, Personalized Tote Bags and Sports Bags, Embroidered Breast Cancer Hats and so much more.